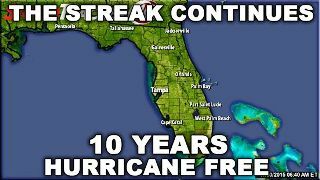 Monday is the official end of hurricane season and in Florida this marks 10 years without a hurricane. And yet, you are paying one of the highest insurance rates in the country. We went straight to the insurance experts to find out why rates haven't gone down and to a consumer advocate to find out what you can do to demand your money back. Insurance companies say you can blame it on building materials. As the prices increase for items like roof shingles, siding and windows, it costs the companies more to fix a house ravaged by storms. However, one consumer advocate isn't buying the excuses and he says the only way to get change is to elect people who will fight to get our money back. Consumer advocate Sean Shaw says without storms, insurance companies aren't rebuilding homes and all that extra money you're paying the insurance companies is more than likely lining the pockets of CEOS. The storms of 2004 and 2005 caused billions of dollars in damage in Florida. Few homeowners were surprised when insurance rates shot up the next year, but they didn't expect them to stay high, and 10 years later homeowners are outraged to be paying among the highest rates in the country. Insurance companies have given several reasons for the high rates over the years: sinkholes, insurance fraud, PIP etc. At the same time, many of Florida's biggest insurers have reported record profits. "At a certain point you have to tell the insurance agency we don't care what the excuse is, rates are going to stop and they will not go up and until we elect someone like that we are going to be in this slow creep where they keep going up, keep going up, keep going up," Shaw stressed. Insurance companies argue they have to price their rates for what is expected to happen in the future, and they never know when a hurricane could strike. Here are four things you can do to get insurance companies to drop their rates. Elect leaders who vow to take on insurance companies. Demand existing state leaders start getting tougher on the insurance industry. Aggressively shop by getting property insurance quotes from as many companies as you can to ensure you get the best rate. Take the time to install roof straps and other hurricane mitigation items to get a break in your insurance rates and secure your home if we have a hurricane in the future.